Shimano’s Alivio brake is a popular choice on hardtails and entry-level full-suspension bikes, and we’ve ridden dozens of sets over the past couple of years. Come rain or shine, on smooth local trails, ragged BikePark Wales runs or lift-assisted laps in the Alps, it’s never let us down. Precut and pre-bled out of the box, the Shimano Alivio brake is simple to fit, although you’ll need to add rotors and the correct adaptors for your bike, as they’re sold separately. Bleed kits can be purchased for under £15, including Shimano’s filling tool, and the mineral fluid is much safer for your skin. The lever clamp isn’t split, so you’ll have to remove your grips and shifters to slide them on the bars. 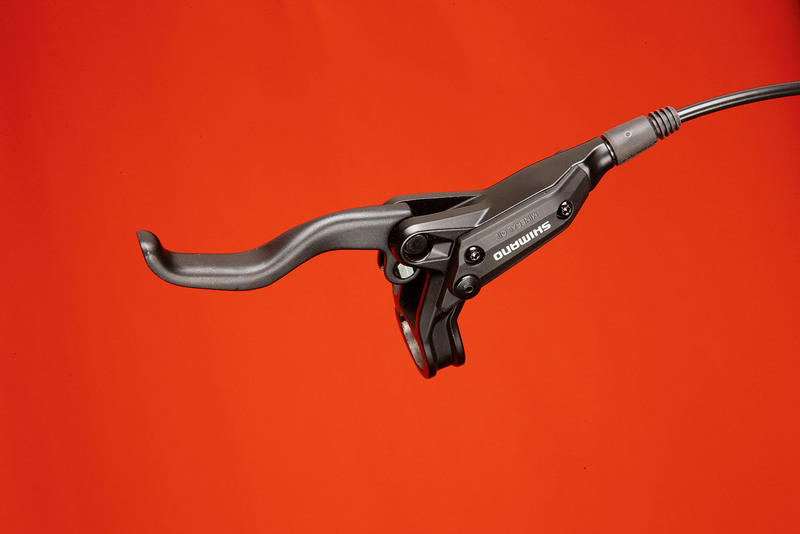 As well as being exceptionally comfortable, it’s a very long lever — certainly enough to fit two fingers on — so we ran the clamps really inboard on the bars, with the shifters next to the grips, to obtain a good single-finger braking position. The flipside is that you get loads of leverage, which is coupled with good modulation and power, to make an efficient stopping system. It doesn’t quite have the outright authority of the Avid DB3, particularly on the rear, where we would recommend upping the rotor size to 180mm for most applications to give a little more power.